Early this morning, NOAA’s National Tsunami Warning Center issued tsunami warnings for the south coast of Alaska and British Columbia, after a powerful, magnitude 7.9 earthquake rocked the Gulf of Alaska. Tsunami watches were issued for California, Oregon, and Washington State. A few hours later, all watches and warnings had been canceled, leading many Twitter users still-half asleep at their computers to wonder: Why is it so damn hard to predict a tsunami’s strength ahead of time? The reason has to do with the fact that the ocean is very large, and our earthquake and tsunami monitoring infrastructure is relatively limited. As geophysicist Mika McKinnon explained to Earther, a tsunami did arrive, and we predicted its timing pretty damn well. The thing that was—and always is—difficult to predict is the tsunami’s size. To understand why, it’s useful to start at the source of the event. Tsunamis are essentially massive ripples, emanating out from an area where water was displaced. Think throwing a stone in a pond, only now, the stone is a meteorite the size of a bus, or an undersea volcanic eruption. Or, in this case, a large earthquake. All of these events displace water, creating ripples. Trouble is, it’s very difficult to tell how much water. “How can you tell how the displacement of water was distributed?” McKinnon said. “You’re not going to be able to measure it in the open ocean, where the distance above background is a few inches over a few kilometers. You have to wait for the wave to come to shore and shoal,” the process by which tsunami waves bunch up on shore, the crest-to-crest distance becoming shorter as the height of the wave grows taller. That said, tsunami forecasters aren’t entirely in the dark. McKinnon explained that after an earthquake occurs, the event is thrown into a tsunami modeling system, which gives “a good estimate on travel time.” To determine if a tsunami wave is going to propagate widely, forecasters then turn to the Deep-ocean Assessment and Reporting of Tsunamis (DART) network, a series of ocean buoys maintained by NOAA that detect the pressure of waves from a passing tsunami. The final piece of the puzzle for understanding a tsunami event is tide gauges (those orange dots on the Tsunami Alert maps), which measure ocean surface displacement near the shore. It isn’t until we have that tide gauge data—plus any human observations—that we can really say how big the tsunami event is going to be. Tsunamis look different from the normal ebb and flow of the tide. As the National Weather Service explains, when they come ashore they move like a “fast-rising flood or a wall of water.” Another tell is if the water drains away suddenly, exposing the ocean floor and appearing like a very low tide. Powerful tsunamis that cause large changes to the water level can lead to flooding over a mile inland, according to the NWS. Sometimes, as was the case this morning, we get lucky and tsunami events are minor. But it’s important to note that even if a tsunami generates little flooding, it can still be deadly. Monster waves or no, tsunamis carry a lot of energy. 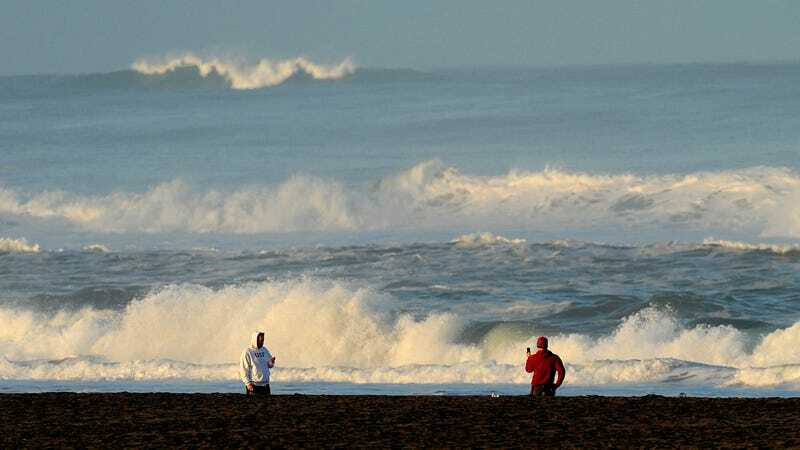 Plus, the first wave isn’t necessarily the largest one, and depending on the bathymetry of the shoreline, waves can pile up and become bigger in certain locations. (Bays can funnel water in, causing waves to interfere constructively and get taller.) That’s where human reports are very useful, but in the case of this morning’s tsunami, such reports were few and far between. Fact of the matter is, there just aren’t that many people living on the south coast of Alaska. Given the complexity of the situation, McKinnon said it’s a good idea to stay out of the water for a few hours after a tsunami warning is lifted.